The last post I wrote about City Center’s Progress was back in March. It’s amazing to see how quickly this project is going up. I just read a great article about the current progress on Access Vegas’s blog. 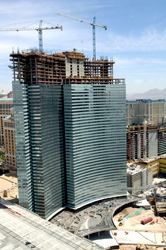 Well, the top of VDARA Condo/Hotel has been reached! They added the 57th floor recently. I’m personally so excited to see this project come to fruition. This development alone will transform the Las Vegas Skyline! It’s going to bring culture, shows,retail, fine restaurants, and more living choices for those people wanting to live on the strip. Not to mention all of the jobs it has and will create for our local economy. BRAVO MGM GRAND!! There are still many units available in all 5 residential buildings, so if you’d like more information, please contact me toll free at 866-589-1646 or you can email me at Felipe@felipecrook.com.